Freelancing is the new job security for life. Forbes writer and Co-Founder and President of Work Market, Jeff Wald confirms this new labor paradigm shift with his article 5 Predictions for the Freelance Economy in 2015. An independent study by Freelancers Union and Upwork identified there are over 54 million freelancers currently in the United States. That's roughly 34 percent of the entire U.S. workforce. The Huffington Post predicts a seismic shift in the labor force is not only coming, corporate America is embracing this dynamic change. Some opportunities coming over the future horizon to consider . . .
Forbes lays a solid foundation for Employee contracts coming in the future, similar to executive hiring agreements - No way. Yes way. As reported by Newsweek, now you can create your own job. Developing the habit of scrolling to the bottom of company web sites. This habit may reveal hidden gems in the form of opportunities, where a company allows you pitch them a job that utilizes your unique talents to benefit the organization's success. Win-Win-Win for the company, its clients and You. Freelancers are becoming a dominant force in the workplace. With Upwork.com blazing trail to go from $1Billion to $10billion over the next 5 years, here are the The Best Freelancing Sites of 2016 by Grant Lingel. Here are Top 10 Sites for Finding Freelance Jobs in 2016 by John Boitnott. Global Workplace Analytics provides Win(employer)-Win(employee)-Win(clients/ customers) opportunities to work remotely from home. 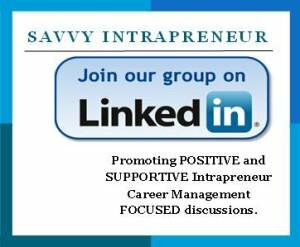 Occasionally, we will publish opportunities and resources to position Intrapreneurs to make informed business career management decisions. 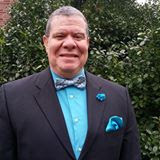 A good primer for Savvy Intrapreneurs to stay career nimble is the book Crazy Is A Compliment - The Power Of Zigging When Everyone Else Zags by Linda Rotenberg. 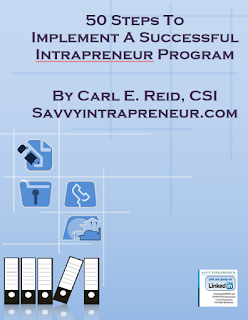 View other suggested readings in the Savvy Intrapreneur Knowledge and Smart Gadgets Library. "Deep Expertise at intersections of Business, Networking and Technology"